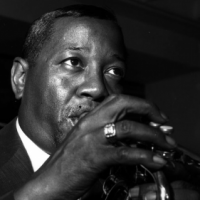 Join WKCR this Monday, January 30th as we celebrate the 106th birthday anniversary of one of the foundational figures of the Swing Era, jazz trumpeter Roy “Little Jazz” Eldridge. Known for his signature boldness in rhythm and sound, Eldridge is often credited for his role in bridging the musical styles and approaches of Louis Armstrong and Dizzy Gillespie. Eldridge is often characterized by his use of tritone substitutions and virtuosic solos. Born in 1911 in Pittsburgh, Pennsylvania, Eldridge spent the early years of his career touring with a number of dance bands. By the 1930s, Eldridge was living in New York, performing with the likes of Cecil Scott, Elmer Snowden, Teddy Hill, Fletcher Henderson and Billie Holiday. After leading his own band from 1936-1941, Eldridge continued to play with the giants of swing, including Gene Krupa, Artie Shaw, Benny Goodman, Ella Fitzgerald, and Earl Hines. Notably, in the 1950s and 1960s Eldridge participated in the Jazz at the Philharmonic and Jazz Artist’s Guild recordings. Tune as we celebrate the virtuosity and innovation of Little Jazz with 24 hours of uninterrupted Swing.